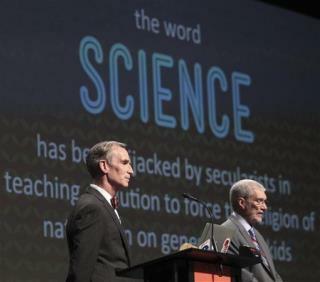 (Newser) – After watching last night's Bill Nye-Ken Ham creationism-versus-evolution debate, Brad Kramer has a message for the world: "I’m a Christian, and Ken Ham doesn’t speak for me." Yes, Kramer believes "God created the world" and that "the Bible is all the word of God, and that it is truth from cover to cover," he writes for the Daily Beast. Yet he's still "tired of Ken Ham and others like him, defining what it means to believe the things I do." After growing up believing exactly what Ham believes, he ended up disillusioned as a teen when he realized his "view of science and faith ... increasingly made no sense of either." Next on Newser: In Indian Ocean's Oldest Shipwreck, a Clue to Rome? Evolution is a stupid word that can never satisfy itself and defies perfect definition. If it did, all of us would ultimately be pure spirit and no flesh to read the word "evolution" in hard-copy. What is evolution's apex, its finish-line, its final product? In other words, we'd be as we began...in the beginning...not in the End, and then, PING: dissolved into a final nothingness. Think, for God's sake! Look: beleive what you will, and any way you believe it, but no matter what anyone believes or why, the straight TRUTH is: I have a choice! I believe that Jesus Christ is: God, manifest in the flesh, I believe the earth is about 6-7 thousand years old: why because Archeology and artifacts and science prove this. I have studied "Dispensational TRUTH" and God said there would be a period of 7K years and the 7th day would be a day of rest! I am NOT corralled or made to believe what any man says, or said! I have a KING JAMES Bible, and I choose to believe that ITs precepts are right and true and can never steer me wrong! Problem is: people won't read that "BOOK" because it reads them and IT knows them and they can't stand that! they want God to help them in a time of need but when a scripture verse comes along to do so, they get mad! IT has always been "Who's" in charge. the authority!